This past Wednesday was the 100th day of school. My students were so anxiously awaiting the day to do everything around the number 100. Counting forwards, backwards, by 2s, 5s, and 10s to 100, making posters of 100 things, writing 100 words, hopping for 100 seconds, and making 100-Fruit Loop necklaces were all in the mix. In one project, a student said that if he had $100, he would buy a bologna sandwich. Then, he also said if ate 100 marshmallows, he would vom (what our class calls vomit – It sounds nicer). A lot of kids wrote stories about being 100 years old, sitting in a chair and knitting, while one girl said she would be in the circus. I’ve got some pretty cool kids. But it made me realize that these 5-year olds have the almost effortless ability and sparked motivation to think of something super cool, and immediately express it with ease, fluidity, and creativity. How fun it must be to have the mind of a kid! Seriously! Remember the times when you would come up with crazy fun ideas and write stories and draw pictures and put stickers all over everything? One girl told me through infectious giggles that she put 100 stickers on her dog’s head cone. So much fun! Alas, those days have gone for ye ol’ adults. And it must be showing because when I asked my students if I looked 100 years old, they said no – more like 72. YIKES. Many things have happened over the last month, much of which involved traveling and having so much fun with our family. Yet, as I always find it hard to write when I’m on the road, returning home conversely held an anvil of writers block over my head. Have I been cooking? Absolutely! 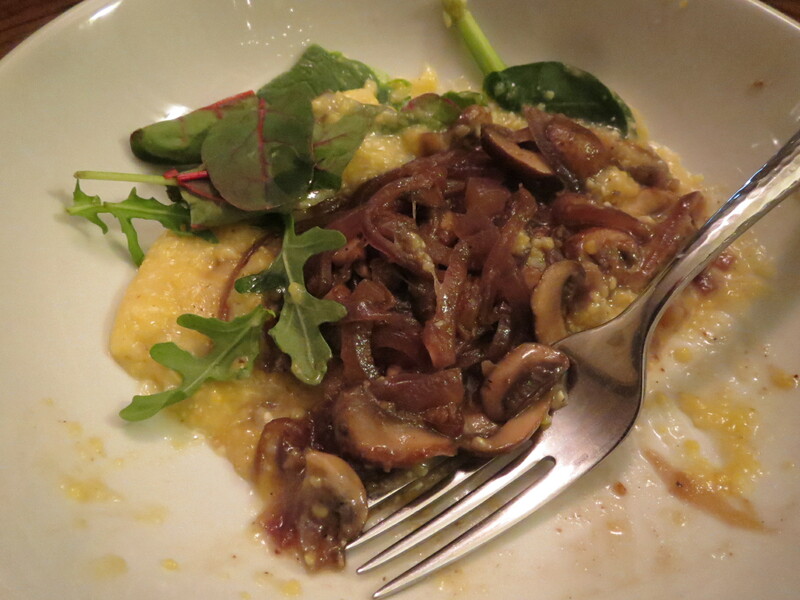 Made a vegan version of grits with red-eye gravy, no less! Have I been writing? Sure! There are bits and starts and notes of soon-to-be blogs all over my notepad and computer. Have I actually completed anything? Nope! Just like the laundry piling up in the closet, intention is there, but execution is not. Rob and I were on TV! 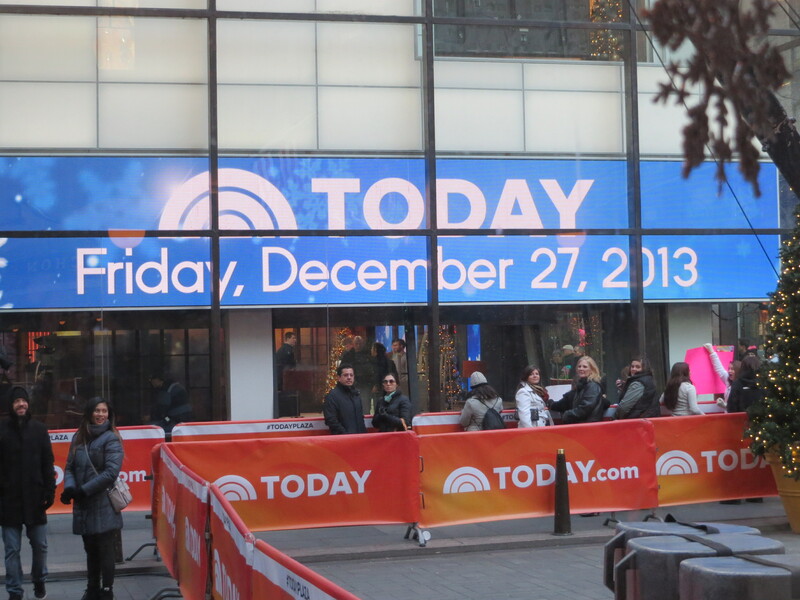 We made it onto the Today Show for all of 2 seconds! It was super dark, a sign was covering Rob’s face, and you had to pause, rewind, slow-motion play, and repeat, in order to see us, but we are TV stars now! We had LOTS of great food – my Aunt and Uncle’s football Sunday food followed by filet of beef with horseradish, potatoes, and creamed spinach hit the spot on a rainy Sunday night in Long Island. In Connecticut, Rob’s mom made our favorites including the Chicken Francese that I will never be able to perfectly recreate. While in NYC, we ate at a small, almost hidden gem of a steakhouse called Quality Meats. We ordered soybeans. Rob tried beef cheek (liked it! ), shrimp (liked it! ), and octopus (not so much). Due to the first of these many winter storms, our flights were cancelled out of the northeast, leaving us driving all the way down the I-95 corridor to get home in time for work. I slept through Delaware. The state also cost us $8 in tolls. I didn’t think that was fair. Finally, the wonderful, yet unusual cold Jacksonville weather has inspired us with cozy, warm meals like Cardamom and Citrus Roasted Chicken. Really, anything with cardamom is going to be amazing – it is a spice often used in Scandinavian and Middle Eastern countries. It is the warmth in Pulla (Finnish Cardamom Bread, or as my Great Grandmother called it, “Biscuit”), and the spice that sits on the back of your throat in Chai Tea. While it tends to fall into the cold-weather-sugary-sweet-treats spice category (think nutmeg, cinnamon, and cloves), I actually prefer using it in savory ways. When cooked with protein, cardamom adds a grassiness and earthiness to the meat that pairs organically. With the brightness of citrus and hearty herbs, a dish is complete. Thus was born my Cardamom and Citrus Roasted Chicken. I actually purchased an already cut-up 8-piece chicken, as it was surprisingly cheaper than the whole Roaster. But if you can’t find the cut up whole chicken, a whole Roaster will work just as well – just stuff the cavity with the leftover citrus and rosemary. This recipe is also very versatile if you only like white meat (buy the breasts bone in and skins attached), or dark meat (thighs would be divine). 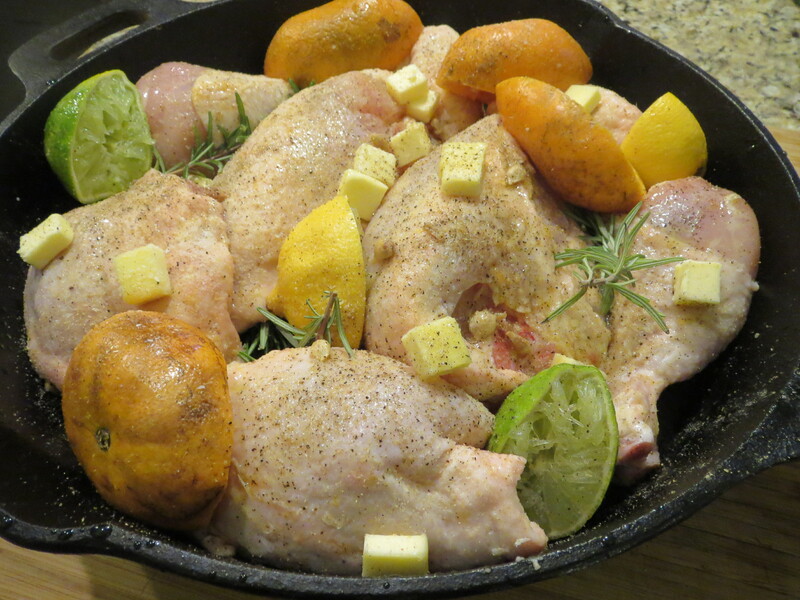 Using my trusty cast iron skillet, I organized my bird like a jigsaw puzzle, drizzled over the juice of 2 tangerines, 1 lemon, and 1 lime and added the citrus shells to the dish (we are at the height of citrus here in Florida – it’s awesome). 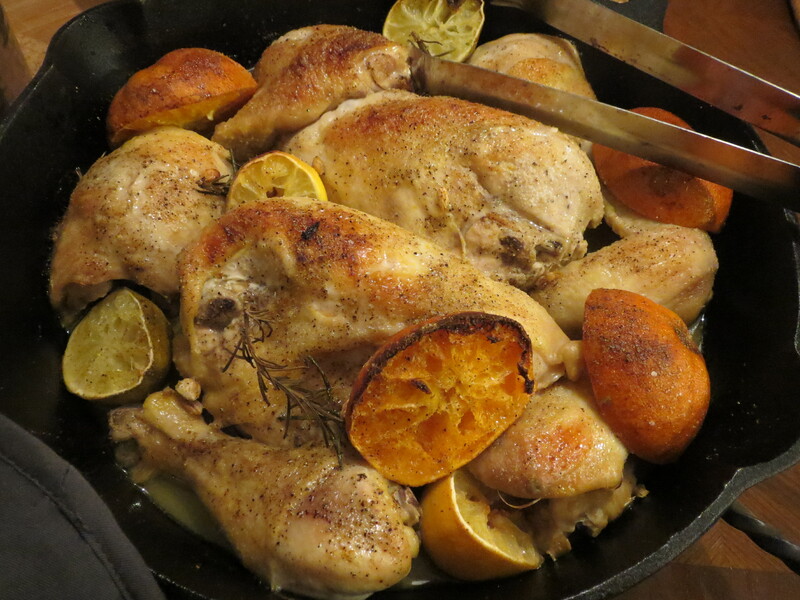 While cooking, even more flavorful juice seeps out of the citrus, naturally basting the bird. With a liberal sprinkling of s&p, about 1 tsp dusting of ground cardamom, and 3 large rosemary sprigs tucked in open crevices, the bird was ready for its final touch: butter. With only 3 tbsp of butter dabbed on the bird, it browns just enough, and the fat from the butter emulsifies in the cast iron with the citrus and chicken juices, creating a fabulous, no fuss gravy for the roasted chicken. After 45 minutes in a 400 degree oven, let rest, then serve with Steamed Parmesan Broccoli, and a buttery chardonnay, and enjoy. Occasionally, when our class is sharing our “New News” in the morning, I like to share what I made for dinner the night before. I shared this one, and generally got responses with lots of Ooooos and Yuuummms. Except for one, who incredulously asked, “But where’s the pasketi?” Through the eyes of a child, a key component of my dish was clearly missing. But, also gave great inspiration for the next night’s dinner! The Oregon Coast is known for many wonderful things: the fishing, logging, rugged and picturesque beaches, amazingly horizontal rain, and knock your socks of wind. During the summertime, the berries are so abundant, juicy, wildly out of control, and ready to burst in the sunlight. While hiking, the smells of nature overwhelm the senses, and the lavish growth provides oxygen in a way that only Vegas casinos try to mimic. It’s almost blissfully intoxicating. But then, there are specific facets of our little unique area that make Coastie wives, like many of us here, count down the days for the next tour orders. Most of us have lived in many areas and, for better or worse, follow our devoted and honorable husbands to wherever their duties lead. Some places are great, some are debatable due to preference and weather, and some, well, downright takes some getting used to. Actually, some make us seethe. We bubble, foam, and stir during needed girls’ nights, finding comfort not only in the local cuisine, but in each other. I think this is typical girlfriend-venting fashion, and it is definitely in style in Coos Bay. A while back, I met Chef Michael Chiarello at one of his retail stores in California. He was very friendly and we spent a good deal of time chatting about my mom and The Lazy Susan, storytelling, cooking, and my blog (which is my favorite mixture of the latter two). He also told me about how he cooks his asparagus – in a sauté pan with only a little water, a fat of some sort, s&p and that’s it. Cook them over fairly high heat until the liquid is gone, and you are left with the most vibrant green, crisply tender asparagus to where even roasting can’t compete. Well, being a true fan of roasting veg, I had to give it a try. I have been cooking my asparagus, and many other sturdy veg (including springtime green beans) that way ever since. Today, as I whipped up a quick lunch to eat in the backyard and soak up the extremely needed Vitamin D filled UV rays, I stared at my cooking green beans watching them jump, bubble, spit, and spat. It was kind of a simple violent, yet exhilarating way to cook, the oil and water keeping true to their non-emulsifiable nature, yet continually working together until only the memory of a sheen remained in the pan. A quick finger-poke-test, and sure enough, the veg was perfect. How funny it is that a perfect result comes from such a bustling process. 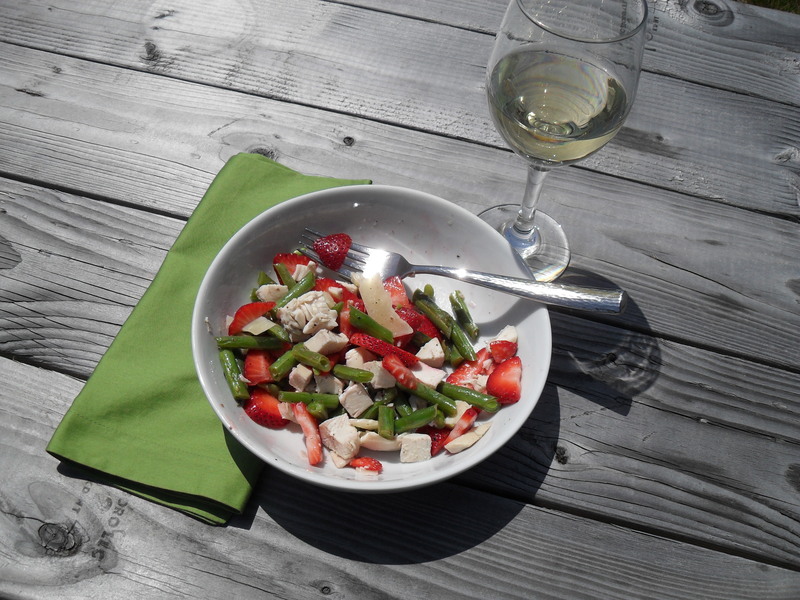 The seethed green beans, concentrated with flavor, mixed with sliced SoCal strawberries (only the best), roasted chicken breast and the salty, tangy bite of shaved Manchego cheese, made the perfect Sunday afternoon spring lunch (and honestly, I think the sun made it even better). The term for this type of cooking preparation is called seething. It fits; heat and agitation and opposite viscosities mixing, releasing, venting, and finally leaving a very clear finish of comfort and joy. Kind of like the girls’ night venting about the frustrations of our chosen/forced environment, over beautiful wine and delicious food. It always ends with hugs and smiles, all around. 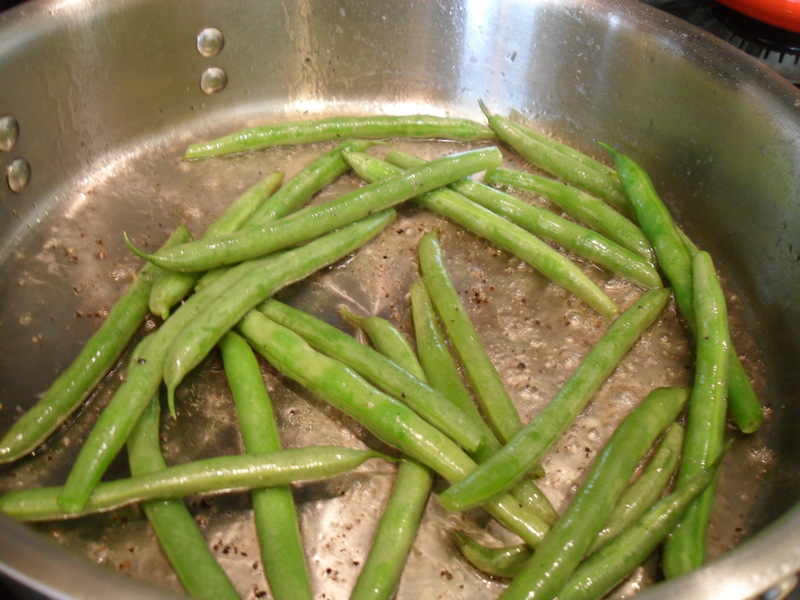 In a sauté pan, heat the water, oil, green beans, and s&p over med-high heat. Stir occasionally, and let cook until all liquid is gone and the beans are tender. 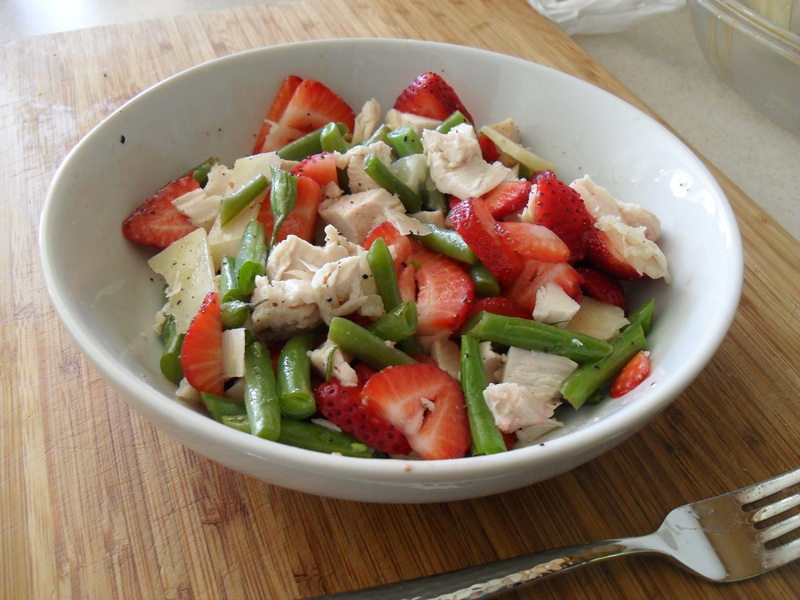 Slice the green beans on a bias, mix with the chicken and strawberries, and squirt the ½ a lemon over the salad. Sprinkle with just a touch of fresh s&p, and top with the shaved Manchego cheese. So it turns out my sickness last week was a bit worse than my initially self-diagnosed cold with sore throat. Feeling worse and more run-down as the week went on, I showed up to school on Friday with the mindset that it was just one more day till the weekend – I could do it. But with quite a few independent, but similar, you-don’t-look-good statements, coupled with our secretary mentioning that pneumonia is going around, I realized the germs were quickly beating my stubborn immune system to a phlegmy pulp, and decided to call a substitute and go to the doctor. Turns out I had bronchitis (better than pneumonia!) and was told to sleep, sleep, sleep. So that Friday, after eating the last bit of a fabulous need-to-have-any-time-let-alone-when-sick chicken and leek soup, I took some NyQuil at noon, and the rest of the day/evening/night was a mix of drooling sleep and foggy awakeness. In one of my sleep states, Rob went out and got fixin’s to make Mom’s English Muffin Pizzas (EMPs) for dinner. How did I get so lucky to find such a great guy?! After a hacking coughing fit during the night, then a very discombobulated morning thinking Rob was late for work (his duty was the next day), we decided I needed a bit of that Oregon fresh air to clean out the lungs, and brain, a bit. A simple walk would do just that. At the lakes next to our house, there are lovely trails, small wildlife, many relaxed fishermen, and one giant goose. Always surrounded by many mallards and other ducks, this goose is obviously the King of the Lakes, honking and flapping his big white wings whenever anyone threatens the air around his brood. This goose is enormous. Turkey-sized. I’m really not exaggerating and find it hard to adequately express just how absurdly rotund he is (although my mind goes directly to pounds and pounds of delicious goose fat to confit with. Figures.). Anywho, we pulled up to a parking pot at the lake right next to His Gooseness, his bleats and honks penetrating our heat-roaring car. Giggling we walked away to enjoy our moments outside, sans rain. As we trudged up our last hill, slow and wheezing (well, I was, at least), we spotted him – big, white, and oh so territorial, marking his land right next to the passenger side tire. As we stepped closer, his head lifted. Another step, a blink. Another step, a throaty hiss – his long thin pink tongue sticking out like an old lady’s angry pointy finger. Tail feathers still planted firm on the ground, he did not stand, he did not flap. He just blinked his beady little eyes, continually hissing his attack warning. “Be careful,” Rob kind of giggled as he saw me venturing to reach the passenger door. Well, karma is a you-know-what. At that moment Mr. Would-Be-Sunday-Night’s-Dinner-If-I-Could-Get-A-Hold-Of-Him screamed/honked, reared up on his skinny webbed feet, and I swear those little eyes squinted and turned fiery red. Screaming like a little girl, I flapped more than him and ran away, and thus inevitably became a hacking breathless mess. Not moving from his spot, Mr. Fatso Goose just sat back down, never once leaving his land. Goose: 1. Jill: 0. Rob: laughing hysterically. Being sick, it wasn’t a huge foodie week or weekend. But I’ll include the fantastic soup that helped to heal me the two days prior, thus giving me the energy to take on a goose. And lose. ** This is a very fresh and tasty soup, plus easy and fast to make – I ate it solely for two days straight (solely by choice – there was fresh Rockfish in the fridge). 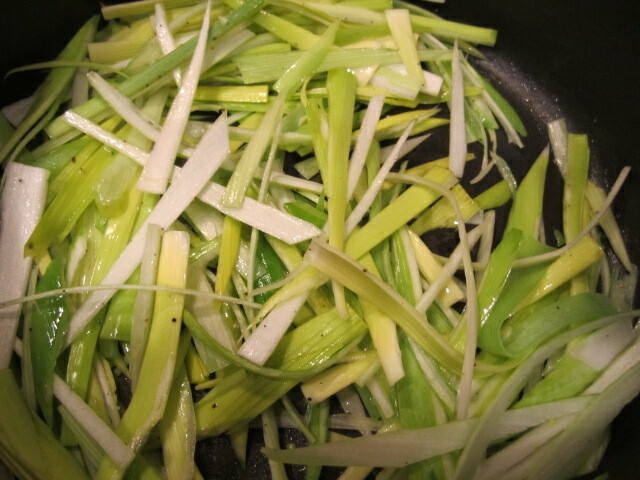 1 huge leek (or 2 medium – the leeks up here are amazing), white and light green parts rinsed, cut in half, then sliced into linguini shape. 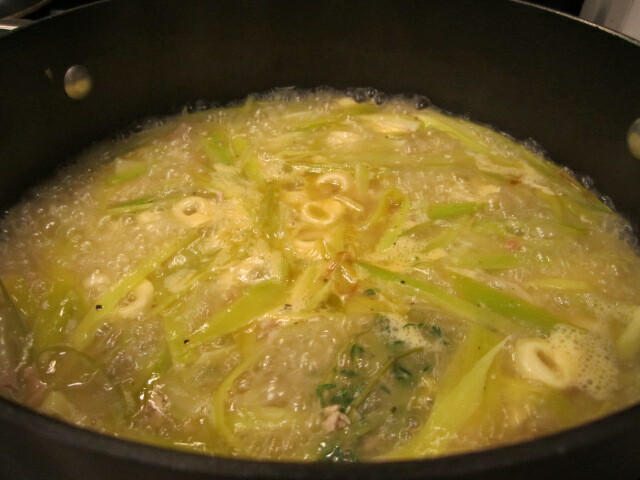 Melt the butter in a large soup pot, and saute the leeks until just soft (season with s&p). Add the chicken, then the liquids and juices, and the herbs. Bring to a boil and then simmer for about 5 minutes to develop the flavors a bit. 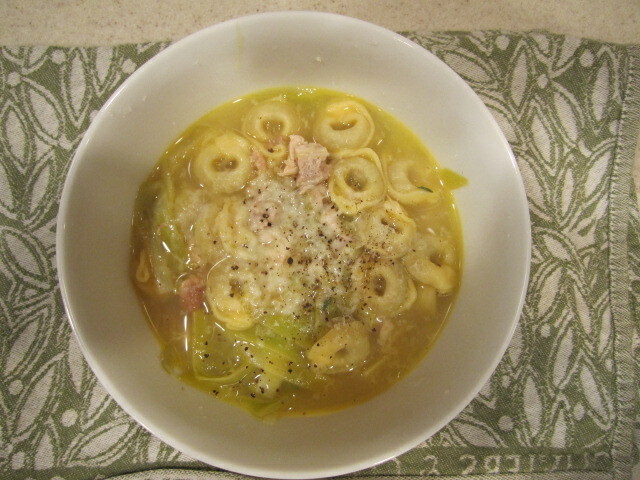 Turn heat back up, add the tortellini pasta and cover the pot, cooking the pasta in the soup (depending on the pasta it should take anywhere from 5-8 minutes). Cooking the pasta in the soup really adds texture to the broth (from the starches), making it thick, different from a French slurry. Taste for seasoning and remove the sprigs (most of the herbs will have fallen off the stems). Ladle into large bowls and serve with a fresh grating of Parm. Reg. on top. Enjoy, even when you are perfectly healthy! !